The folk and traditional arts are rooted in and reflective of the cultural life of a community. Community members may share a common ethnic heritage, cultural mores, language, religion, occupation, or geographic region. These vital and constantly reinvigorated artistic traditions are shaped by values and standards of excellence that are passed from generation to generation, most often within family and community, through demonstration, conversation, and practice. An online grant search is available to find information on NEA grants from 2000 to the present. The NEA National Heritage Fellowships recognize the recipients' artistic excellence and support their continuing contributions to our nation's traditional arts heritage. 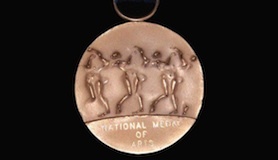 The National Medal of Arts is the highest award given to artists and arts patrons by the United States government and is awarded by the President of the United States. Eddie said music has taken him to so many places. In Part 2, we follow him on these travels as Eddie brings his old-time fiddling across the country and around the world.